Mariposa's Tales MARIPOSA'S TALES: Teasing the Tongue! My Word Filled Wednesday entry is below this post! I love food pics, but my DH gets so embarrassed when I snap photos at restaurants. Oh my does that look wonderful. Happy WW! Mmm... what a succulent looking spread! I think I would like to try that! 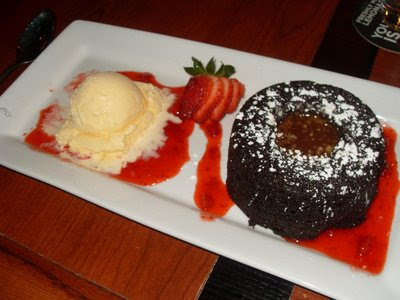 Is it molten cake? That looks SOOOOOOOOOOOOOOOOOO yummy. I wish I was eating that right now. I'ma tongue teaser for sure! Is it wrong to mention that I'm very hungry now. Oh my! That looks divine.